Why Won’t The Buyer Go Faster? 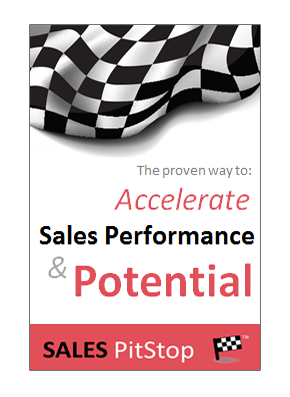 Sellers are often frustrated by the speed of the buyer. The problem is obvious – they go too slow! It is not the sales persons fault. The seller has clearly analyzed needs, defined the optimal solutions and provided the information that is required (including ROI calculations and case studies). Yet the buying decision is moving at a snail’s pace. The problem is that the information you are providing is not enough to nudge the buyer towards a decision. There can be many reasons why this happens and it may have little to do with the real merits of your sales proposal. However, it could have a lot to do with how it is being interpreted by the buyer. Buyers are supposed to make decisions based on reviewing the information and analyzing the facts. The process is meant to be rational and objective. However the reality of how people decide is somewhat different. There are inherent flaws in how people process information and make decisions (at least when judged from a rational economic perspective). This has been the focus of much scientific research. Human fallibility means that people are prone to; misread the information, be unduly influenced by others, or be swayed by impulse and emotion. The research has listed the flaws very well. More important still, it has started to show how they can be compensated for. The result is a menu of ways by which the seller can adjust his, or her message to nudge the buyer more effectively towards a decision. You can find out more about the science behind ‘nudging’ by clicking here (LINK). Below is a list of 9 ways to nudge the buyer to make a decision – it is taken from a number of the leading books in the field of cognitive research (link to list). We have taken some short-cuts in the explanations and simplified some of the concepts to help the seller apply it fast. The objective is to help you to nudge the buyer by adjusting how your information is communicated and the choices presented to the buyer. So, have your message or pitch to hand as you review the list. As humans we have a tendency to simplify. One way in which we do this is through assumptions, heuristics and rules of thumb. If something is complex and convoluted then it slows our thinking down. The customer simply doesn’t have the time, or attention to pay attention to all the detail. 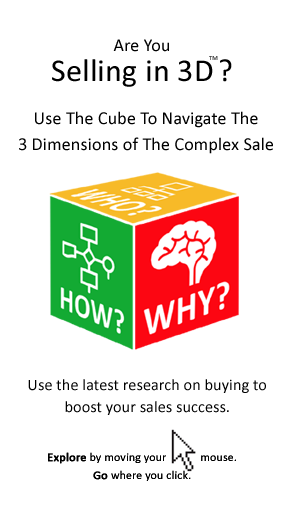 The role of the salesperson is to help simplify the decision for the buyer. – Help the buyer to present a simple and compelling message to stakeholders. Ensure there is a big headline and a compelling elevator pitch. How can your message be simplified for the buyer? To find out more about the implication of decision simplification strategies on the part of the buyer click here. In general people have a tendency towards over-optimism. They tend for example to overestimate their strengths and down plan their weaknesses. It is called an optimism bias, or to use the less technical term ‘glass-half full thinking’. There is a likelihood that the buyer sees himself or herself as above average, so the seller must appeal to the buyer’s positive self-concept. At the same time the seller can carefully help the buyer to more objectively benchmark themselves with others. How can your message support a more positive (and yet realistic) self-evaluation? The buyer may have an optimistic expectation regarding outcomes, or results achieved. The down side here is that the buyer may be overlooking some of the risks involved. At its simplest, the seller must help the buyer to envisage their future success while managing any risks involved. How can your message provide the buyer with a more optimistic and yet realistic expectation of success? Inertia can have a powerful hold over us. We often cling to what is familiar, shying away from what is new and unfamiliar. The tendency is to stick with what we know, versus taking a chance on what we don’t know. That is until the tension for change becomes so great that the binds with status quo are separated. In the meantime it can result in a resistance to change and leave people settling too long for unsatisfactory situations. The seller needs to understand how the various stakeholders are invested in the status quo and the risks associated with change. What aspects of the buyer’s Status Quo should be preserved? Sellers must help the buyer to build a bridge between the past and the future. That means connecting with the good aspects of the buyer’s present status quo and bringing them forward into any proposed new solution. The seller must help the buyer to build tension for change creating awareness of the limitations of the status quo and the prospects of ‘a better tomorrow’ with their solution. Sellers make a virtue out of what is new and are quick to dispense with all that went before. However, the seller needs to gauge receptivity before telling the customer that what he /she has being doing up until now is no longer working. Sellers often under-estimate the adoption challenges their solutions place on customers. They need to recognize that their solutions often require changes in terms of the buying organization’s broader ecosystem (e.g. process, system, structures, strategies etc.). In addition they need to help the customer to set realistic goals and plans around adoption/implementation. Does the message protect at least some aspect of the status quo? Helping stakeholders to be explicit about trade-offs is an important ingredient of embracing change. While sales pitches often focus on the benefits they often overlook what are people going to have to lose or give up. Helping the buyer to recognize that some short term sacrifices may be required for longer term gain is important. Most people are stubbornly consistent in terms of their attitudes, as well as their behaviors. Indeed, psychologists tell us it is hard to be otherwise. The technical term is cognitive dissonance and it is something that unknowingly de-rails sellers. It is the discomfort experienced by buyers when simultaneously holding two or more conflicting: ideas, beliefs, values or emotional reactions. How we see ourselves (and the world around us) can be rigid and often sets the parameters of our thinking and our behavior. In short it is hard to act in a manner inconsistent with our self-concept, our values or beliefs. What are the key beliefs (both positive and negative) held by buyers in relation to your solution space? Changing attitudes and beliefs ain’t easy. Especially those that are wrapped up with how people see themselves, or their organizations. Yet we may not even be aware of beliefs and attitudes as they are often subconsciously held. For the seller drawing attention to beliefs is first step in change. The role of the seller is to help the buyer to hold a mirror up to their needs and their beliefs. Does your message resonate with existing attitudes & beliefs? Sellers need to understand the strength and rigidity of buyer attitudes and beliefs and tailor their message accordingly. For the seller some tension among the buyer’s existing attitudes and perceptions may be important to creating the demand for their solution. However if the tension is too great, then the seller’s message is likely to flounder. As humans we are hard-wired for emotion. That means until computers start making buying decisions, emotion and impulse will have a role to play in how we chose products and suppliers. Sellers must connect with the buyer’s emotions. There are as many as 48 different emotions ranging from pride to fear. They add context and depth to how even the most hard-nosed rational decision criteria is applied. Does the message connect with the audience’s emotions? The buyer’s interpretation of information, people or events related to the sale may be determined by pre-programmed emotional responses (often subconscious). For example an immediate like or dislike of a salesperson, or a gut instinct that something either does, or does not feel right. Such emotions may be helpful or unhelpful, they may be rational, or not. Regardless, they are of interest to the seller. Does the message sooth any negative emotions involved in the buying decision? Understanding the buyer’s motivations and emotions is an important element of any fact-find, or needs analysis. Sellers need to ask their customer’s how they feel about the decision. However, eliciting the buyer’s true motivations requires that the seller gets closer than is normally the case – buyers are slow to open up to strangers. Fear of loss can be a greater motivator than prospect of gain. That is a very old sales adage which research shows is often true. The implication, as sellers know, is that people will pay to avoid the risk of loss. However their calculation of the likelihood or the extent of the loss tends not to be very scientific. It can be easily swayed by emotion and other factors. Do your customers suffer from probability blindness? Cognitive research shows that most people are not very good when it comes to calculating risk. They are for example prone to overestimate the likelihood of rare events (such as a terrorist attack), while under-estimating the risk of more common ones (such as cancer). The implication is that sellers need to sell risk as effectively as politicians and newspaper headline writers. How can your message emphasize the avoidance of risk or loss? Sellers need to understand the buyers understanding of the risks involved in the decision, the likelihood of occurrence and the cost when they do occur. Then they need to help the buyer to re-calculate the risk. We are social creatures – our success depends on our interaction with others. This is particularly the case in large organizations and it adds a political dimension to the decision. In addition, we are continually looking over our shoulders to see what others are doing. This is manifest in what scientists call a ‘conformity bias’, where our decisions being swayed by our peers. Does the message convey a powerful social comparison? Social comparison can play an important role in our decisions. This in part explains the power of case studies, customer stories and sectoral reports for the seller. Telling the buyer about what their peers are doing (and how they are using your solution) is probably the most effective way of telling them about your product. Some customers and markets are influenced by a tendency of conform, or what is otherwise called a ‘herd mentality’. However, to leverage this effect it is important to know just what herd your customer belongs, or aspires to belong to. Who does your customer compare themselves to? Familiarity is generally a good thing. Information and events that are recent and familiar have more power over us. It is not just that we are more likely to remember it, it goes further than that. Familiarity with a company or solution can create a preference for it over the unfamiliar. This is something that scientists have shown can operate at a subconscious level. How can the familiarity of the message be increased? What is recent and familiar can also shape our perception of the likelihood of an event. For example the buyer who has just attended a webinar with real world case studies of network security failures, is likely to attach a higher probability to such a failure, than a buyer who has not. If we know of, or can recall an event or a situation, then we estimate its probability as being greater. This is a key rationale for demand generation-type marketing. More fundamentally, it is a key reason for consistent repetition of the sales proposition or marketing message over time. Familiarity is created with repetition, or to be more precise with marketing dollars. Has your message been repeated enough? Familiarity isn’t necessarily fussy about the source, indeed the real sources of information and experience can become blurred. Something we read or were told, can become part of our own personal experience. For example the buyer may end up telling a story in a meeting about a company that he, or she knows about, but may have long forgotten the source (i.e. a vendor case study). Sellers must strive to ensure that all those involved in the buying decision have some level of familiarity with their company and its solution. They must also deepen their appreciation of marketing’s role in building marketplace familiarity for their brand. If the seller’s company or solution is not in itself familiar, then it should be linked to other things that are familiar to the buyer. This might be achieved by using analogies, metaphors, or parallels from other areas. There is a flip side to the familiarity bias as there is to many of the others. If something is very familiar we stop paying attention to it. The challenge is to draw attention to what is new, but not so new as to be unfamiliar and inconsistent with past attitudes and experience. It is to add novelty to familiarity! We are often biased in favor of the immediate, putting short term gain ahead of long term consequences. Scientists have shown that for some people the bias for immediate results/gratification is present from childhood. While adult maturity is often defined as the ability to make short term sacrifices for longer term gain, quarterly corporate performance targets often reinforce similar short-termist behaviors. Are the benefits promised sufficiently close to hand, or short term? As sellers when we present our ROI and Payback we must be aware that a far-away in the distance benefit is often worth less than a smaller more immediate one. As sellers we need to understand whether the buyer wants short term or long term benefits from our solution. The above list condenses a lot of the science in the area of buyer decision making, so it is worth reviewing more than once. However, the best way to get started in nudging your customer is to pick one or two of the above factors and apply it to your next communication with the customer. Now you know a little about nudging and its power, how can you apply it in your sales interactions? Specifically, how many of the above nudges can you integrate into your pitches, presentations and proposals? For a full list of the research sources we have found very helpful in our research into the psychology of buying click here. Hi Ray, Great post. I’d like to read more, but it seems some of the links to sources might be missing?